The City of Minneapolis and Minneapolis Park Board have selected a development team to redevelop the Upper Harbor Terminal site. 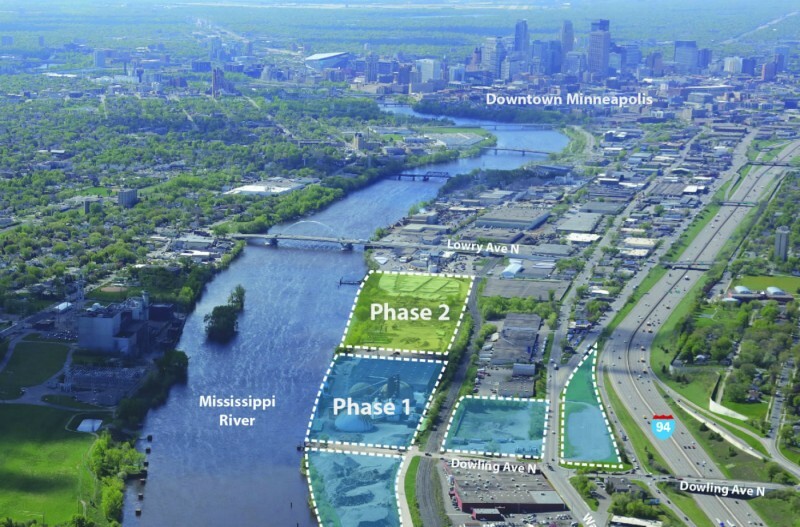 The team, made up of three companies, will be responsible for the planning and construction of the 48-acre site along the Mississippi River in North Minneapolis. United Properties, THOR Development and First Avenue Productions are all local firms with experience developing and managing area properties. Their selection to the development team was approved by the City Council and Minneapolis Park Board in January. A public review and comment period was kicked off with a January 31 open house at Minneapolis Park Board headquarters. The starting point for discussions: A development proposal prepared by United Properties, Thor Construction and First Avenue Productions last year—before they were officially selected for the development team. In the document, the team proposed a site that serves as a cultural destination while benefiting surrounding neighborhoods. An amphitheater would seat up to 10,000 people. Green spaces would surround the amphitheater, and a riverwalk would extend the length of the site. Up to 1,000 housing units would be included and potentially 400,000 square feet of retail, office and manufacturing space. Equity has been a major focus of the Minneapolis Park Board in recent months. Redevelopment of the Upper Harbor Terminal site is seen as a great opportunity to address disparities in the park access in racially diverse and economically disadvantaged areas. Those unable to attend the Upper Harbor Terminal open house earlier this year continue to have the opportunity to offer their input as the planning process unfolds. Visit upperharbormpls.com to complete a survey on the site’s development, sign up for email alerts, and learn about future public meetings.